Although the subject of Versailles during the reign of Louis XIV (r. 1643-1715) has been a perennial favorite among historians of French art and culture, several recent texts and museum exhibitions have attempted to shed new light on the palace and its contents. Whereas some have called into question the novelty of Versailles or the top-down model of absolutism it is said to embody, others have examined a diverse range of artworks and cultural productions, including such ephemeral media as flowers, musical performances, and silver furniture, to explore how they participated in the “fabrication” of the Sun King. One important theme that has emerged is the global character of Versailles, or rather an awareness of how the palace (and French art more generally) was profoundly shaped by cross-cultural interactions stemming from exploration, trade, diplomacy and war. In 2017, The Metropolitan Museum of Art, along with the Musée des châteaux de Versailles et de Trianon, will stage a major exhibition entitled Visitors to Versailles (1682-1789), which will consider the foreigners’ perspective and showcase a range of objects: from courtly fashions and diplomatic gifts to depictions of the palace in the waning days of the ancien régime. In spring 2016 I taught a seminar at the IFA on the topic of “Versailles Reconsidered.” It was organized in conjunction with the upcoming Visitors to Versailles exhibition and with a symposium, held at NYU, entitled “Versailles in the World”. Students were asked to choose an object, many of which are in the Met’s collection, and write a short essay analyzing it in relation to the themes of the course. 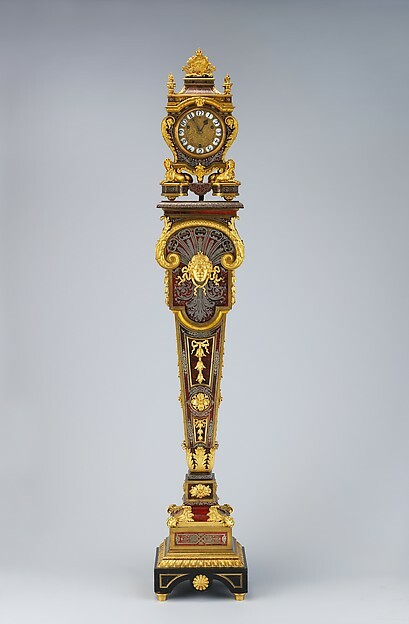 What follows is an engaging virtual exhibition comprising many different types of objects – prints, playing cards, a portrait, a clock, and a writing desk among them – and offering compelling new insights into the creation, use, and afterlife of Versailles beyond Louis XIV’s reign. We learn about the solidification of royal power through the staging of lavish fêtes in the Versailles gardens; the organization and experience of time at court; the role of garden statues and card games in teaching young aristocrats about geography and moral behavior; and an ambitious attempt to recreate Versailles in the form of a large painted panorama exhibited in New York City in 1819. From the beginning, Versailles inspired herculean feats on the part of the royal administrators, architects, craftsmen and kings who participated in its creation. These essays conjure a sense of those efforts and suggest how their products continue to inspire artists, curators and scholars today. The term “fabrication” is taken from Peter Burke, The Fabrication of Louis XIV (New Haven: Yale University Press, 1992). Among these recent publications are Catherine Arminijon, ed., Quand Versailles était meublé d’argent (Paris: Réunion des musées nationaux, 2007); Robert W. Berger and Thomas F. Hedin, Diplomatic Tours in the Gardens of Versailles under Louis XIV (Philadelphia: University of Pennsylvania Press, 2008); Charissa Bremer-David, ed., Woven Gold: Tapestries of Louis XIV (Los Angeles: J. Paul Getty Trust, 2015); Georgia Cowart, The Triumph of Pleasure: Louis XIV and the Politics of Spectacle (Chicago: University of Chicago Press, 2008); Nicholas Dew, Orientalism in Louis XIV’s France (Oxford: Oxford University Press, 2009); Peter Fuhring et. al., eds., A Kingdom of Images: French Prints in the Age of Louis XIV, 1660-1715 (Los Angeles: J. Paul Getty Trust/Bibliothèque Nationale de France, 2015); Claire Goldstein, Vaux and Versailles: The Appropriations, Erasures, and Accidents that Made Modern France (Philadelphia: University of Pennsylvania Press, 2008); Caroline zum Kolk et. al., eds., Voyageurs étrangers à la cour de France, 1589-1789 (Rennes: Presses Universitaires de Rennes, 2014); Oded Rabinovitch, “Versailles as a Family Enterprise: The Perraults, 1660-1700,” French Historical Studies 36, no. 3 (Summer 2013): 385-416; Marie-Laure de Rochebrune, ed., La Chine à Versailles: art et diplomatie au XVIIIe siècle (Paris: Somogy éditions d’art, 2007); and Robert Wellington, Antiquarianism and the Visual Histories of Louis XIV: Artifacts for a Future Past (Farnham, UK: Ashgate, 2015).